Want to take your little Mario out for Halloween before he eats a growth mushroom, grows up, and starts stomping goombas on his own? Well, we're not gonna lie... that day may be coming. But you still have a chance to warp through coin-filled sewers and save Princess Toadstool together, as a family! 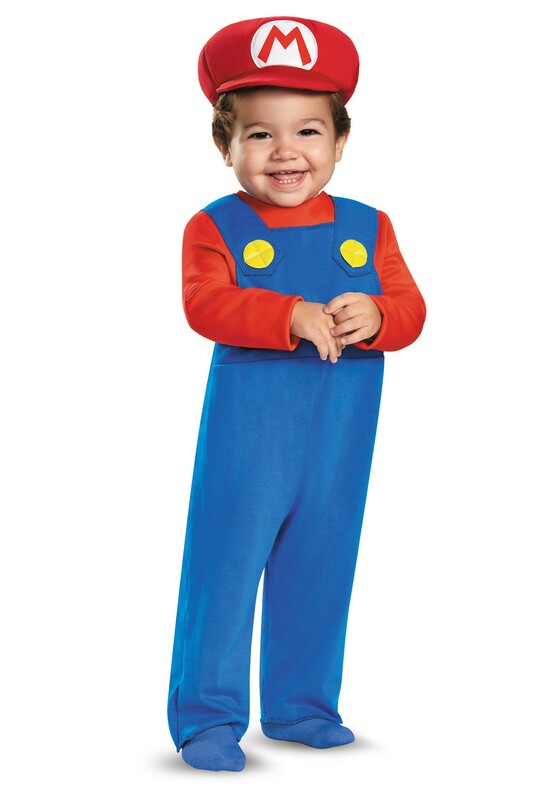 This adorable Mario Infant Costume is all you need. It's your Koopa-fighting plumber's chance to suit up as a hero everyone young and old will be able to recognize immediately. And hey, who wouldn't want to spend their first Halloween on a quest through the Mushroom Kingdom? This officially licensed and brightly colored Super Mario suit has that iconic, classic video game look, and best of all, is easy for your little guy to get into and wear. It includes a simple and stylish foam hat, and the jumpsuit itself is a one-piece that holds in place with a very basic "hook and loop" system at the back. This outfit's also an eye-popper. The big gold buttons are part of the design, which is just one of the features that gives the Mario Infant Costume a surreal, larger-than-life quality. Mario will look as if he just jumped right out of the Nintendo game! And since you're going out as a family, why not give Mario some company and do a group costume with a video game theme? We've got a wide selection of Nintendo costumes and accessories... including both Mario Brothers, Donkey Kong, and Zelda. So have the whole family take a look around!